A Court of Chevaliers may be formed with the authorization of the Executive Officer on either a jurisdictional, regional or Chapter level. The Court must be made up entirely of Chevaliers. All Chevaliers should be active, in that they have participated in their last observance and have mailed the required observance report to the Service and Leadership Center. The function of the Court is to confer the Degree of Chevalier on those named by DeMolay International’s Supreme Council and to aid in all areas where DeMolay may be furthered through the participation of Chevaliers. In receiving the Chevalier degree, all Chevaliers have been obligated to perpetual service to DeMolay, and they should keep this uppermost in mind. Sponsor and maintain an annual Chapter Membership Contest and assist with jurisdictional membership programs. Assist in the judging of ritual, athletic or similar competitions. Promote better understanding of the Order through presentations of history and ideals on the Chapter level. Be active in the area of extension, so that new Chapters may be formed and membership increased. Assist and encourage visitations among DeMolay Chapters. Help out at jurisdictional conclaves and conventions. The Court should plan an annual observance and invite all the Chevaliers within its area of responsibility. Sample bylaws for Chevalier Courts are found in the appendix of the DeMolay International Bylaws, Rules and Regulations. In the early 1930’s DeMolay founder Frank S. Land had been thinking of an honor he could bestow on DeMolays and Senior DeMolays for outstanding service to the Order. He wanted to honor them now, instead of waiting for them to be nominated for the Legion of Honor in years to come. He also wanted to honor Senior DeMolays who had been working with chapters even though they were not Masons, but had performed outstanding service to the Order. In those days, DeMolay was recognized by only about 50% of the Grand Lodges, consequently many Senior DeMolays were active in chapters due to the lack of Masonic support. In November of 1936, “DAD” Land, assisted by Harold Bergstresser and John McKibben, proceeded to write a Ritual for the conferral of the Chevalier Degree. This became a reality in March, 1937 and “DAD” Land began to nominate DeMolays and Senior DeMolays for this distinguished honor. Mother Chapter, of course, had the first investiture and it was held June 2, 1937 at the Little Theater in the Municipal Auditorium. Forty-one active DeMolays or Senior DeMolays of Mother Chapter were invested with the Degree on that date. John S. McKibben, Jr. was recognized as the first Chevalier, and the rest of the nominees were numbered accordingly. 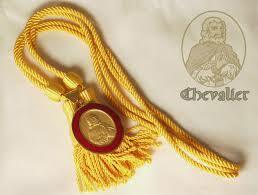 Today, the rolls of the Chevalier Degree number approximately 27,000, many of whom are organized into Chevalier Courts. These Courts are encouraged to be active in their support of DeMolay and its ideals.